Beverage and lifestyle brand Merican Mule has introduced Moscow Mule in a can, as part of its efforts to reduce the use of copper mug. The new can has been developed for Moscow Mule to decrease the health risks associated with copper mug, which is considered as potentially poisonous. The company is providing the canned cocktail as a single twelve ounce can or pack of four. The canned cocktail includes vodka, natural ginger and lime, said Merican Mule. Moscow Mule in a can will also be marketed in larger liquor store chains, grocery, as well as bars and restaurants. 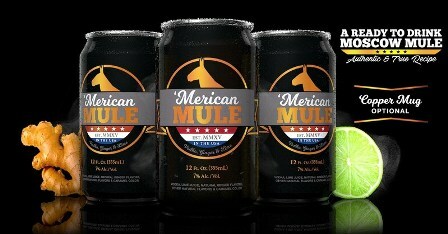 Merican Mule CEO Dean Mahoney said: "You no longer need to go to a bar or restaurant to have a Moscow Mule. In fact, our company slogan is Copper Mug optional. Merican Mule chief marketing officer Steve Pawlik said: “We saw an opportunity to give cocktail-lovers something convenient, cost-effective and cool." Three millennial entrepreneurs have launched Merican Mule in 2015. The 7% ABV and spirit-based canned cocktail was developed as an alternative to the handcrafted bar beverage. Image: Moscow Mule in a can is an alternative to drinking from a copper mug. Photo: courtesy of PRNewsFoto / Merican Mule, Inc.